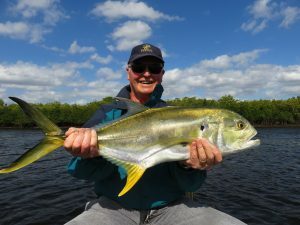 Jack crevelle are a very aggressive, hard fighting fish that are found year round in Florida and provide great sport on light tackle. They range from hand-sized fish up to twenty-plus pound bruisers. There is no finesse with these fish, they just pull until they can’t pull any longer. 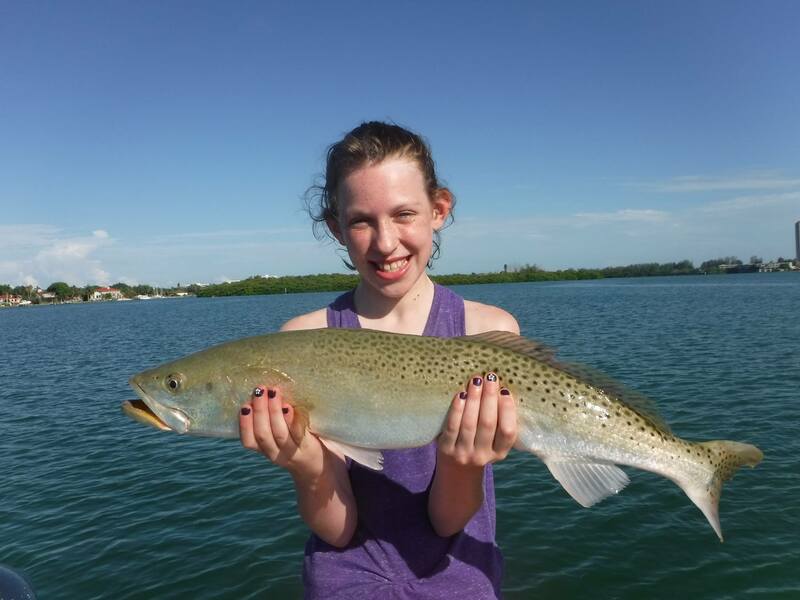 Jack crevelle fishing is exciting as they will hit almost any lure or bait. The key is finding them. Jacks are normally schooled up in tight bunches and are quite competitive, resulting in an aggressive strike. They have strong, dark meat and are not considered good to eat. 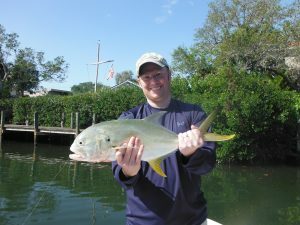 Often times anglers will see jacks feeding up on the surface, churning up the water as they go on a feeding spree. Just about anything cast into the action will draw an instant strike. In the cooler months jacks will be found up in Phillippi Creek and other deeper canals in Siesta Key. Jacks are found throughout the area at one time or another. They will be found on the deep grass flats while trout fishing. Fish will also move in very shallow and feed actively on bait fish in water only a foot deep. Perhaps the best jack crevelle fishing occurs in the cooler months. Jacks move up into creeks, rivers, and canals, concentrating in these areas. The Braden River in particular holds schools of jacks, some quite large, in the winter. Shallow diving plugs allow anglers to cover a lot of water. They also elicit violent strikes. Soft plastic baits on a jig head work very well, too. If no surface activity is seen, anglers working docks, oyster bars, drop offs and holes should locate a school of jack crevelle at some point. Phllippi Creek is across from Siesta Key and in another very reliable spot to target jacks. Trolling plugs is another great way to locate fish.